Many skills are learned before a student can fly an airplane or a maintenance student can rebuild an aircraft engine. Just as practicing scales is a fundamental part of learning to play the piano, the student does not “make music” until the ability to combine the notes in a variety of ways is acquired. For the student pilot or technician, practicing specific skills is essential, but flying a cross-country trip or repairing a collapsed landing gear requires “putting it all together” in the right way to achieve success. The following section looks at the challenge of learning to perform several tasks at once, dealing with distractions and interruptions, overcoming problems with fixation and inattention. It also describes the benefits of using realistic training scenarios to develop these abilities. Multitasking is the simultaneous execution of two or more tasks. A hallmark of the proficient pilot or mechanic is the ability to multitask. In aviation, multitasking involves two different abilities: attention switching and simultaneous performance. It is useful to distinguish between the two types of multitasking because developing both types of abilities is an important part of aviation training. Continuously switching attention back and forth between two or more tasks is attention switching. For example, when Beverly uses a checklist to perform a preflight inspection, she must continuously switch her attention between the checklist and the equipment she is inspecting. She looks at the checklist to retrieve the next step in the procedure, and then looks at the equipment to perform the step. For many kinds of tasks, attention switching is the only way to accomplish multitasking. For example, it is generally impossible to look at two different things at the same time. The area of focused vision (called the fovea) is only a few degrees in span and can only be directed to one location at a time. Similarly, people cannot listen to two conversations at the same time. While both conversations fall upon the ears at once, people must devote their attention to the comprehension of one, to the exclusion of the other. Psychologists sometimes refer to these limiting features of human information-processing capabilities as bottlenecks. For example, people have bottlenecks within the individual perceptual channels of hearing and seeing. Another important bottleneck becomes apparent when people attempt to process the information perceived or retrieved from memories. Indeed, it seems impossible to think about two different things at the same time. Performing several tasks at once, or simultaneous performance, is the second type of multitasking. [Figure 2-20] This type of multitasking becomes possible when no bottlenecks are present and when one or more of the tasks being performed are skills developed to the point of being automatic. 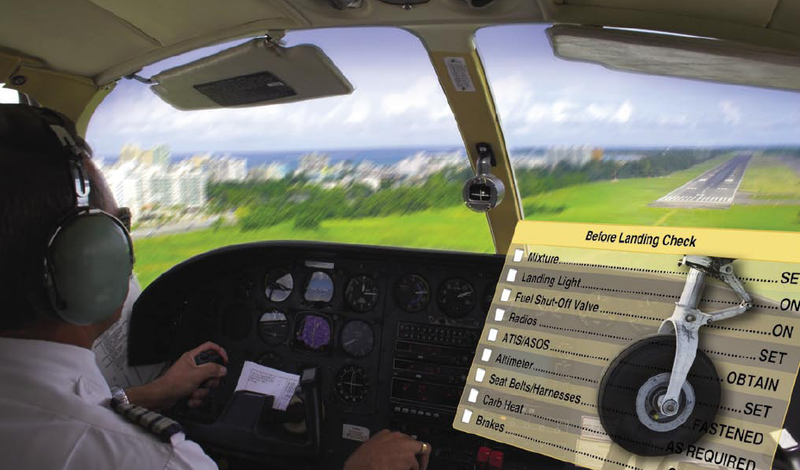 For example, the experienced instrument pilot is able to perform basic attitude instrument flying while communicating with ATC. For these pilots, scanning instruments and responding to minor attitude deviations with small control inputs has become automatic. The attentional resources of the pilot are free to devote to thinking and talking about other topics. Figure 2-20. A pilot is required to perform several tasks at once during approach and landings. It is important to note that the ability to simultaneously perform tasks is a fragile phenomenon. For example, suppose Beverly is performing the basic attitude control task and communicating with ATC when she suddenly encounters turbulence. The attitude control task quickly increases in difficulty and begins to require more and more deliberate attention. Her ability to perform both tasks simultaneously quickly degrades. Since doing several things at once is a natural part of aviation, instructors need to help students develop both types of multitasking abilities: attention switching and simultaneous performance. Before students are asked to perform several tasks at once, instructors should ensure that the student has devoted enough time to study and practice such that the individual tasks can be performed reasonably well in isolation. Inexperience with an individual task can often hinder attempts to learn combinations of it and other tasks. For example, a student distracted by trying to interpret unfamiliar symbols on a sectional chart inadvertently deviates from assigned attitude or heading. An instructor recognizes the need to spend more time with these skills in isolation. In this case, there is nothing about the experience of controlling the aircraft that helps students better understand chart symbols. A distraction is an unexpected event that causes the student’s attention to be momentarily diverted. Students must learn to decide whether or not a distraction warrants further attention or action on their part. Once this has been decided, the students must either turn their attention back to what they were doing, or act on the distraction. An interruption is an unexpected event for which the student voluntarily suspends performance of one task in order to complete a different one. Interruptions are a significant source of errors and students must be made aware of the potential for errors caused by interruptions and develop procedures for dealing with them. A classic example is an interruption that occurs while a student is following the steps in a written procedure or checklist. The student puts down the checklist, deals with the interruption, and then returns to the procedure—but erroneously picks up at a later point in the procedure, omitting one or more steps. Since human attention is limited in focus and highly prone to distraction, people are vulnerable to two other types of problems: fixation and inattention. Fixation occurs when a student becomes absorbed in performing one task to the exclusion of other tasks. Instructors see many examples of this in student performance. Beginning instrument pilots characteristically fixate on particular instruments, attempting to control one aspect of their performance while other aspects deteriorate. Fixation on a task is often a sign that the task has not received enough practice in isolation. That is, the student has not yet mastered the task well enough to perform it in addition to other tasks. Fixation can happen even when individual skills have been reasonably mastered, when students have not yet learned the importance of managing their own limited attentional resources. Inattention occurs when a student fails to pay attention to a task that is important. Inattention is sometimes a natural by-product of fixation. Students fixate on one task and become too busy to attend to other tasks. Inattention also happens when students are not busy: attention may drift when they become bored or think that a task does not deserve their attention. In some cases, this type of inattention is difficult to eliminate through training and practice. For example, it is well known that humans perform poorly when placed in the role of passive monitor. Many studies have shown how performance rapidly deteriorates when humans are asked to passively monitor gauges or the progress of an automated system such as a GPS navigation computer or autopilot. Furthermore, it seems that the more reliable the system becomes, the poorer the human performance becomes at the monitoring task. The first line of defense against this type of inattention is to alert the student to the problem, and to help students develop habits that keep their attention focused. One way for instructors to identify problems with fixation and inattention is to try and follow where students look. To accomplish this, instructors can glance at a student’s eyes to try to determine where the student is looking. Students who appear to look at one instrument for an extended period of time might have a problem with fixation. Students whose gaze is never directed toward engine instruments might have a problem with inattention. The technique of following student eye movements is useful, but has limitations since looking in the same direction as the student is not the same as “seeing” what the student sees.